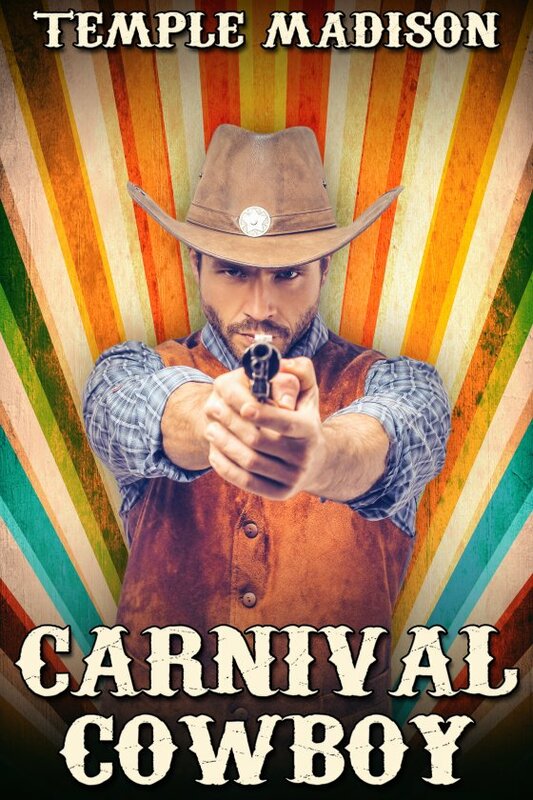 Carnival Cowboy by Temple Madison is now available! At the end of a bloody trail, Johnny Redd finds an incredible secret. While struggling with a bullet in his chest, he crawls along the ground until he finds himself surrounded by a maze of quaint carnival tarps. Inside is a world of color, costumes, false hair, nails, eyelashes — and a man who dresses like a woman. It’s a world of trickery, deception, and lies. Johnny makes it just inside the tent when his strength fails and he faints dead away. When he awakes, he’s reminded of the bizarre reality that surrounds him. It’s that he learns he has been taken care of by a man – er. woman — by the name of Frenchy Starr. The name rolls from the tongue of this fallen angel, this princess of darkness, this twilight queen. She’s a mystery, a dangerously beautiful mystery, and Johnny slowly becomes ensnared in the trap which she sets. After one night of incredible love, a jealous fan shoots Frenchy. Thinking her dead, Johnny’s heart is broken and he leaves in search of something to fill the hole she left in his heart.